It’s been only a couple of months since FreedomPop flipped the switch on its free mobile Internet service and the company is already taking aim at home users as well. Starting today, those in the US with Clearwire WiMAX coverage can pre-order an $89 modem that will provide online access to as many as 10 Wi-Fi-enabled devices. As they do with the mobile version of their service, FreedomPop will offer a chunk of data free each month, with low-cost options for additional gigabytes. Namely, users will receive 1GB of data per month for free and can earn extra allowance by adding contacts to their network and engaging in partner promotions. Beyond that paid plans start at $9.99 for 10GB. This is a pay-as-you go service so you’re free to cancel your paid subscription at any time. By comparison, those on the mobile service get 500MB of free data allowance per month, with paid plans starting at at $10 a month for 1GB, $18 for 2GB, $29 for 4GB, $35 for 5GB and $60 for 10GB. The service is offered through a portable hotspot (Photon) or a USB modem (Bolt), as well as sleeve modems that fit over the iPod Touch and iPhone 4 and 4S. The company says more than 20% of users have bought extra capacity and data usage so far indicates that most people use less than 5.1GB per month. That’s less than the company initially expected, which is why FreedomPop will increase the amount of free data it provides to customers in the coming months. 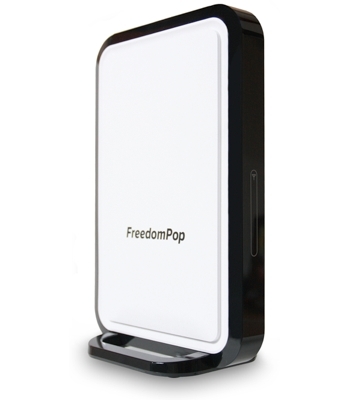 FreedomPop's new Hub Burst modem for home users will begin shipping in January 2013. The company is promising speeds of 9 to 12Mbps and is only accepting signups from addresses where it can deliver such connections. The service will switch to Sprint’s LTE network next year to expand its coverge.